Whenever I visit Cordes-sur-Ciel, I always make sure to visit the wonderful patisserie at the bottom of the hill, Moulin. Their speciality are the gorgeous gateaux and pastries for which France is rightly famous, but they also do these wonderful savoury tartlets. So after scoffing an extraordinary number of them one trip, I decided it was high time I taught myself how to make them myself. These are very easy, and make a wonderful accompaniment to a picnic lunch or a salad. They are also very, very good when gobbled down still warm from the oven when no one's looking. Preheat the oven to 200°C, then line a 32cm shallow baking tray with greaseproof paper. Roll out the pastry on a floured surface so that it fits the container, then line the baking tray on top of the paper. Prick the pastry all over with a fork and add another sheet of greaseproof paper, then fill with ceramic baking beans. Place in the oven for 15 minutes, until cooked. 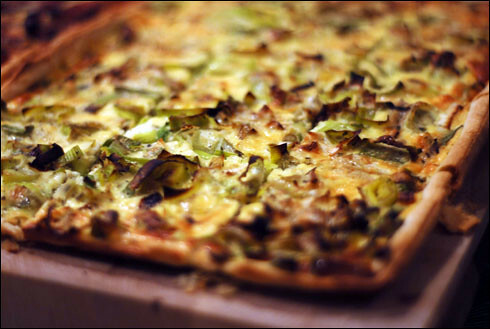 While the pastry is baking, slice the leeks into 5mm slices and gently fry until soft and golden, then set aside. In a large bowl, beat together the eggs, crème fraîche, parmesan and nutmeg, then season with a little salt and pepper. When the pastry is cooked, remove the top sheet of greaseproof paper and ceramic beans, then distribute the leeks evenly on top of the pastry. Gently pour over the egg and crème fraîche mix so that it fully covers the leeks and the pastry case is filled, then bake in the oven for a further 15-20 minutes. When cool, transfer to a flat wooden board (a large chopping board will do) and slice into three lengthways and quarters widthways so you have perfect hand-sized portions. You can either serve it warm or at room temperature - your choice! That looks great, although the edges could use a bit of carving by the side, which could easily be done by gently pressing the knife blade on the crust.